Geocities crawl performed by Internet Archive. This data is currently not publicly accessible. Yahoo! GeoCities is a Web hosting service. GeoCities was originally founded by David Bohnett and John Rezner in late 1994 as Beverly Hills Internet (BHI), and by 1999 GeoCities was the third-most visited Web site on the World Wide Web. In its original form, site users selected a "city" in which to place their Web pages. The "cities" were metonymously named after real cities or regions according to their content—for example, computer-related sites were placed in "SiliconValley" and those dealing with entertainment were assigned to "Hollywood"—hence the name of the site. Shortly after its acquisition by Yahoo!, this practice was abandoned in favor of using the Yahoo! member names in the URLs. In April 2009, approximately ten years after Yahoo! bought GeoCities, the company announced that it would shut down the United States GeoCities service on October 26, 2009. There were at least 38 million user-built pages on GeoCities before it was shut down. This page contains pictures and information about Beetles that we found in the Brisbane area, Queensland, Australia. Beetles, order Coleoptera, is the largest and most diverse order of insects. Their size is ranges from 0.5mm to 200mm. J.B.S. Haldane's famous comment on beetles has been quoted many times. During a lecture on the biological aspects of space flight given in 1951. Haldane remarked that "the Creator, if He exists, has a special preference for beetles, and so we might be more likely to meet them than any other type of animal on a planet that would support life". We have the discussions on why insects, especially beetles, are so success below. Coleoptera means ‘sclerotised wings’. All beetles have hard forewings, called elytra, which do not do much help in flying but cover the membranous hind wings and protect the abdomen. Some beetles cannot fly but some others can fly very fast. When flying the hind wings extended to the fright position. The forewings, or elytra, are lift up vertically or in side way, which is believed will have some aerodynamic effect on the fright. When at rest, the elytra meet edge to edge in a straight line at the centre over the abdomen. The hind wings are neatly folded under the elytra. The beetles are usually bright in colour. They are complete metamorphosis. The adults are usually feed on nectar and pollen. Some are feed on plants leave. Larva may be found underground or under the bark of living trees. There are more than a hundred families of beetles in Australia. We listed here with the most common species and those easily found in Brisbane. We will gradually increase the species and families in the list, with more pictures and information. Please come back and check our web site from time to time. Beetles in this family usually have a flat body. They have long legs and running fast. Most of them are predators with prominent mandibles and palps, They hunt for small insects either on ground or on tree trunks. Some of them are flightless. Staphylinidae is a large family although we seldom see them. They are from very small to small size. They are either predators or carrion feeder live in soil and leaf litter. Usually they are elongate and half of their abdomen is exposed. The larvae are active with fully developed legs. The beetles in this family are usually medium to large size, occasionally with bright colour. They have distinctive lamellate antennae which can open like a small fan or close tightly. 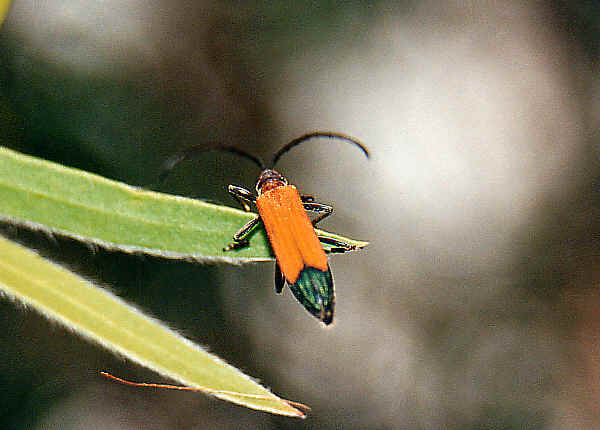 Adults beetles usually feed on leaves and flowers. Jewel Beetles can normally be seen feeding nectar on flowers in bush during a sunny day. Some Jewel Beetles are leaves feeder. Their body is elongated and flattened. They are brightly coloured and often have a metallic sheen which make their common name Jewel Beetles. Beetles in this family are elongated form, with acute hind angles on prothorax and a clicking mechanism enabling them to jump by sudden movement of prothorax and hind body. 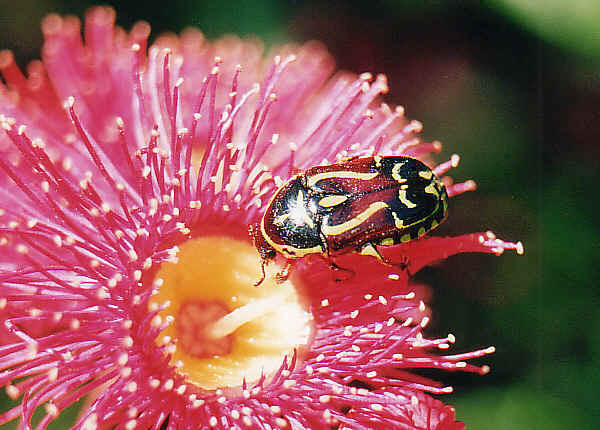 Lycid Beetles are elongated beetles and may be found on flowers or on plant surfaces. Some species adults are nectar-feeders, some are not feed at all. Their head is usually triangular in shape. Antennae are medium long and thick. Larvae can be found under bark or in leaf litter. Beetles in this family are usually small in size, brown and yellow in colour. Adults bodies are soft, flat and long. Their antenna are filiform. They are abundant on flowers and foliage where they feed on nectar, pollen, or other insects. Larvae of most species are carnivorous, a few species feed on plants. The beetle has large eyes and bright yellow antenna. Its large and strong mandible suggested it is a predator. Its wing covers are black in colour with pink at the back, separated by a white line across. The beetles are partly predacious. They search over plants during the day. They eat eggs, larvae and other slow-moving insects. On rice crops, they have been found feeding on pollen. The egg, larval and pupa stages are in the soil. We sometimes found this black little beetle in Hibiscus flowers in our backyard. They are also known as Ladybugs or Lady Beetles. Adults are oval in shape, body length from 1 mm to10 mm. Like all beetles, their hard forewings cover the membranous hind wings and protect the abdomen. Legs and clubbed antenna are short, which can be hidden beneath their bodies. Beetles in this family are usually black or brown in colour, highly variable in shape. Their antenna are medium length. They feed on variety of dead materials of plants and fungal. All members in this family commonly call Longicorn Beetle. 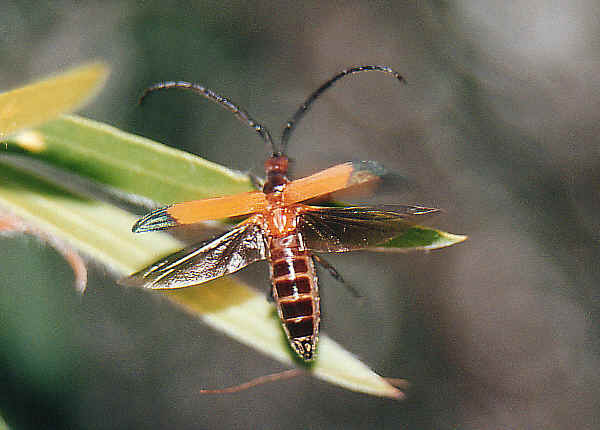 They have very long antennae, more than two-thirds, some are even three times as their body length. Their antenna can directed backwards over their body. Their compound eyes are notched at the base of the antennae. Most species of this family feed on leaves. Leaf beetles adults range from 5 to 15 mm in length and are brightly coloured. They have different body shapes from flattened to globular. Their antenna usually less than half the length of their bodies. This is a small family very close related with the true weevil. Their antenna is straight, not elbowed and not clubbed. Their body is elongated and in cylindrical form. Likes the true weevils, their rostrum is usually very long. Adults and larvae are feed on plants. Their larvae are known to bore into stems and branches. Weevil adults characterized by the elongation of the front part of their head and mouths. Their antennae usually elbowed and clubbed. They usually have rigid bodies less than 10mm, although the largest can be up to 60mm. All of them are plant feeders. Other Families - There are some more beetle in this page, some of them we need your help to identify. Why beetles are so success? Beetles may be success in number of species, but not quite when counting the number of individual. When we go out to the field, usually you will see a lot of ants, moths, flies, and grasshoppers. If you visit some special place, such as pond, rivers, flower plants, forest, etc, you may easily found the dragonflies, butterflies etc. But to find a beetle may not so easily. Instead of saying beetle is a success family, I will say they have the most number of species in their order. So the correction question should be: Why there are so many species of beetles? 1. The ways that we classified all different species of beetles as one order may be not fair. When comparing beetles with other orders of insects, I think we put two many different families into one Coleoptera Order. We put every insects with hard forewings into Coleoptera Order. If we put grasshoppers, stick insects, mantids and cockroaches in different orders, why do we put ladybird beetles, scarab, longicorn, weevil in one order? 2. 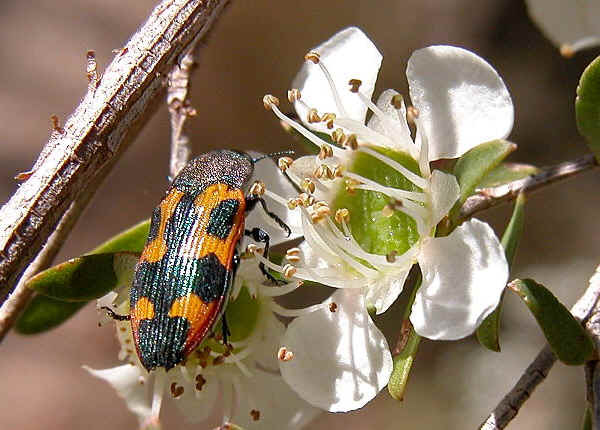 Beetles evolved in flowering season. By the help of insects, plants invented their important organ - flower. The insects not only consume the plants but co-evolutes with them and help plants to develop. When flowers first appeared on earth, it was also beetles first appear on earth. Beetles were not necessary depend on flowers for food, however, flowers provides food for beetles and let them to help for pollination. Flowers and beetles both benefited form each other. Beetle species become the largest number order in Insects. 3. Beetle specialized in food and live in isolated environment. After long time of separations, different group of beetles become different species. 4. Beetles are among the first group of insect who gain the benefit of complete metamorphosis, i.e., they develop from eggs, larva, pupa to adult. They have two completely different body shape and there are a lot of advantages. Those include adults and larvae not necessary to complete for the same food and living resources, adapt to different conditions due to seasonal changes, and to avoid predators in different stage. We would like to thank Justin Bartlett in Brisbane for he constantly sends us email and helps us identify some of the beetle species. Last updated: December 25, 2006.